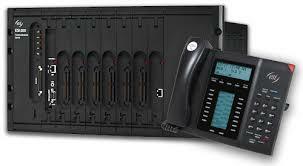 A highly advanced, expandable phone system with extensive, unique call-handling features. A tremendously flexible architecture that fully supports both digital- and IP-based communications. Superior voice mail capabilities with exceptional features and messaging options. A multi-level, highly customizable automated attendant for call routing. Automated call distribution (ACD) to maximize your callers' convenience. Automated call distribution (ACD) to maximize your callers’ convenience. An ESI Communications Server is a powerful tool around which you can build your organization’s entire telecommunications strategy — and you don’t have to know it all in advance. 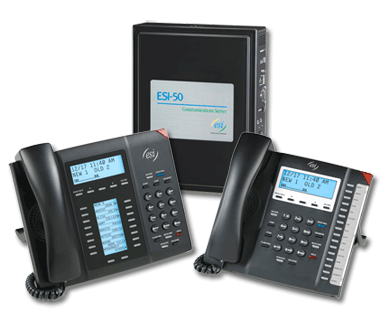 That’s because an ESI Communications Server — the ESI-1000, the ESI-600, the ESI-200, the ESI-100, or the ESI-50 — can be a traditional digital business phone system, a fully standards-based IP telephony system, or any mix of the two. The choice is entirely yours, and the mix can easily change when your needs do. The capacities described below are maximums, which will depend on the specific ESI Communications Server model and extension dialing plan (four-digit or three-digit) which your Certified ESI Installer helps you select. Fully flexible platform Gone are the days when you had to choose between digital and IP, and hope you’d made the right call. An ESI Communications Server’s tremendously flexible architecture can be configured for all-IP, all-digital, or whatever combination of the two your business needs. And, as your business changes, so can the configuration of your ESI Communications Server. Scalability Each ESI Communications Server is built to grow with your business — intelligently. And, thanks to the shared feature set among the ESI Communications Server line, retraining is minimized if you migrate from one model up to the next. You can start small and grow as large as you’re likely to need — up to 336 outside lines and up to 816 stations. Additionally, there’s can support for up to 10 T12 or PRI high-bandwidth lines. Powerful voice mail capabilities The integrated voice mail system includes up to 32 always-available channels and includes ESI’s exclusive Quick Groups™, Quick Move™, and Virtual Mailbox Key features. Your ESI Reseller can also provide ESI’s innovative VIP family of Windows-based communications management tools. Extensive phone options ◦ ESI Digital Feature Phone — 12-Key, 24-Key, and 48-Key. Backlit displays available on 24-Key and 48-Key Digital Feature Phones. ◦ ESI 48-Key IP Feature Phone II — Connects via LAN, WAN, or Internet; provides full ESI feature set via IP, either locally or at remote location; uses industry-standard G.711 and G.726 compression to reduce bandwidth requirements. Backlit display available on 48-Key IP Feature Phone II. ◦ ESI Cordless Handset II — Three models: Digital, [local] IP, and Remote IP; IP models allow Power over Ethernet (PoE) or AC power for your maximum convenience. ◦ Standard analog sets. Advanced phone features Some examples include ESI’s enhanced Caller ID, live call recording and screening, ACD, Esi-Dex™ speed-dialing, built-in message-on-hold, and Verbal User Guide. Esi-Link (multi-site) support Multiple ESI business phone systems can be interconnected across an enterprise’s dedicated WAN, creating virtually seamless connectivity among multiple offices. While some competing systems are unable to provide more than bare-bones phone features in such arrangements, Esi-Linked distant extensions operate as though they were local, providing one-button and abbreviated dialing, simplified call transfer, multi-system hold, conference calling, and message sharing. Remote connection capability With the rapid growth of broadband services like DSL and fiber-optical, IP Feature Phones II can be deployed to small remote locations such as local sub-offices or teleworkers’ home desktops. SYSTEM FEATURES Full integration One cabinet contains a phone system, voice mail/automated attendant, and automatic call distribution — all working together as an integrated whole. Standards-based IP design Each ESI Communications Server’s IP capabilities are supported by compliance with these major industry standards: ◦ UDP ◦ Layer 3 Quality of Service (QoS) support via DiffServ ◦ G.711, G.726, and G.729 packet compression ◦ 802.3 100Base-TX Ethernet interfaces ◦ Layer 2 QoS support via compliance with 802.1p and 802.1q ◦ 802.3af Power over Ethernet (PoE) ◦ DHCP ◦ SIP ◦ Message-on-hold (MOH) recordings This feature provides a professional sound without licensing fees. Use the three supplied music tracks, or record and use up to nine of your own. Auto attendant Provides extensive call routing, including directories, automatic day/night operation, off-premises transfer, cell phone and pager notification, and more. Automatic call distribution (ACD) ACD places sales or service personnel in departments and either (a.) routes a call to the longest-idle agent or (b.) places the call on hold if all agents are busy and then immediately connects when the first agent is available. Constantly updates Feature Phone display regarding queues and wait times. Highest voice quality Records voice messages with 64-kilobit-per-second sampling, for the highest quality sound a telephone line can carry. Account codes Let you verify client billing and manage time more accurately by inserting one or more numerical codes during a call. Call statistics Delivers detailed reports at the touch of a key and provides SMDR. T1/PRI support2 Lets larger offices make fullest use of broadband lines. Up to 384 fully functional analog ports Each allows voice mail, park/retrieve, transfer, page, call waiting, off-premises message delivery and more. Analog ports also allow use of optional ESI Presence Management. Conference calling An ESI Communications Server supports up to 64 conference callers, with up to 16 persons per conference. Esi-Dex speed-dialing Calls any number from three separate lists (personal, station and system); uses Caller ID information or direct keypad entries. Intelligent Call Forwarding™ Forwards calls to you when you’re away from the office and sends along the real caller’s original Caller ID4 information (if it’s someone calling from another extension on your ESI business telephone system, you even see his/her extension number), so you can see who the real caller is.5 Shared-office tenanting Allows multiple business entities to share the same system while maintaining separation of various facilities and features. Depending on the model, an ESI Communications Server supports up to eight tenants. TAPI support (Basic Telephony Service.) Provided via an optional VIP application. Dedicated overhead paging interface Allows intra-system paging through the speaker built into the ESI Feature Phone or through an ancillary overhead paging system. Optional ESI Presence Management ◦ Presence indication ◦ Access control ◦ ESI’s Personal Call routing ◦ Time and attendance logging (further enhanced by optional ESI TimeLine PC software) VOICEMAIL FEATURES Up to 128 built-in voice mail ports “Always-on” channels available for voice mail, auto attendant, call recording without using system trunks or station ports. Massive voice message storage capacity Depending on the model you choose, your ESI Communications Server can boast a voice message storage capacity up to a staggering 1,200 hours. This lends even more practicality to the recording and voice mail features that make an ESI system special. Off-premises message delivery Delivery to a cell phone or home phone combined with pager notification, for extensive notification capability. Urgent messages Can deliver higher-priority messages first. Message Recycle Bin (undelete) Remembers, and can restore, each mailbox’s 10 most recently deleted messages. Quick Groups When a user wants to share a message with several other users, this feature lets the user do so by just pressing VOICE MAIL and the appropriate station keys. Quick Move Press a station key during live recording to move the message automatically to that user’s mailbox. Virtual Mailbox Key A programmable function key “tied” to any mailbox; allows simplified monitoring of a second mailbox. Multiple personal greetings Pre-record up to three greetings and assign them to a programmable key for one-touch selection. AutoPage™ Allows a caller forwarded to a user’s voice mailbox to page the user over the user’s business’s internal overhead paging system. QuickPage™ Lets one station user QuickPage another station by pressing a designated QuickPage key followed by either a station extension or a programmable key set for a station. Guest mailboxes Make it possible to give voice mail to personnel (such as those in outside sales or manufacturing) who may not have actual extensions assigned to them. A guest mailbox can be handled like a regular extension (e.g., listed in the directory, assigned a station key, etc.). Info mailboxes These can be used to give callers information on a variety of different subjects by “publishing” these mailbox numbers. Broadcast mailbox The broadcast mailbox is used to leave a single message in all of the system’s users’ mailboxes. Group mailboxes Depending on model, an ESI Communications Server can support up to 64 group mailboxes with up to 200 members each. Users can set or change the list of group mailbox members. Message notification On a mailbox-by-mailbox basis, the system can be programmed to call an off-premises number or another extension to deliver messages and/or dial to an external commercial paging network to activate a user’s pager. Cascade notification mailboxes Up to 40 cascade notification mailboxes can be assigned to anyone who requires escalating levels of notification (such as to cell phones or pagers) beyond the single level available in all user mailboxes. Q & A mailboxes Up to 20 question-and-answer (Q & A) mailboxes can store 10 questions each. The individual answer segments recorded by the caller are stored as a single message, with the answer segments separated by short beep tones. Optional VIP family of Windows-based applications: ◦ Work with Microsoft® Outlook®. ◦ Provide on-screen call control, voice mail management, contact management, fax server integration. ◦ Text-messaging6 that’s safe from the Internet ◦ Much more than simply unified messaging. And for more specific needs, there also are these VIP Professional-compatible applications: ◦ VIP PC Attendant Console — Helps you more efficiently manage your office’s call traffic. ◦ VIP ACD — Designed around the specific needs of ACD supervisors and agents. ◦ VIP Softphone — Puts the features of an ESI IP Feature Phone II on the PC screen. AUTO ATTENDANT FEATURES Six levels and 100 branches The many branches allow setup of a more caller-friendly answering environment, including a company directory. Virtually unlimited call routing — Includes off-premises transfer, pager notification, more. Station features Call waiting Display shows both calls’ Caller ID information; user can toggle between calls by pressing the FLASH key. Enhanced Caller ID ESI’s patented enhancements allow one-keystroke return of a call as well as quick addition of the caller to the user’s speed-dial list. Personal Caller ID Makes clear who the caller is, rather than using the Caller ID of the main number; this is particularly useful if one should have to call 9 1 1 from a multi-floor or multiple-site business. One-touch access to a number of features This lets the user press dedicated keys rather than having to remember multi-key codes. To access voice mail, the user just presses VOICE MAIL; to perform a conference call, CONF; or, to transfer a call, TRANSFER. Esi-Dex built-in directory ◦ Works with Caller ID to keep an alphabetical speed-dial list; accessible with a keystroke and shown on the display. ◦ Three separate speed-dialing lists: personal, station and system. ◦ Users can make entries directly from the IP Feature Phone keypad, as well as scroll through lists (to save time, users can select which names to view within each list). Caller ID Key™ Shows Caller ID data for an extension’s last 25 callers. The user can return each call by pressing one key. Live call recording Record a conversation, conference call or personal reminder memo for later playback, as well as moving or copying to others’ mailboxes. Live call screening Works like a home answering machine; the user can listen to a message while someone leaves it. The user can pick up the handset at any time to take the call or just let the caller continue to leave a message in his/her mailbox. Verbal Help Key™ and Verbal User Guide™ These use hundreds of prompts to guide users through virtually every feature of the system. Virtual Answer Key™ For use when one is already on another call but wants to give special attention to a second call that’s in call waiting. Set as many as two programmable feature keys to be Virtual Answer Keys. Each plays a recorded greeting telling the caller the user knows he/she is calling and, depending on programming and how the prompt is recorded, can also give the caller an easy way to dial out to another extension where he/she can gain immediate assistance. Service observing Lets authorized personnel silently observe (and record) station-to-outside calls. Off-premises “reach-me” Allows a caller forwarded to one’s voice mailbox to reach the user at an external number (e.g., home phone or mobile phone). Dedicated HOLD key Supports both system-wide and exclusive (station-specific) hold. Permits virtually unlimited hold “orbits.” (Also supports hold/retrieve with analog phones.) Holds calls for easy pickup at any station without elaborate codes to remember. For exclusive hold, just hold down the key for a second. Optional Expansion Consoles. ◦ 60-Key Expansion Console connects directly to 48-Key Feature Phone (Digital or IP). ◦ Second Expansion Console connects to 60-Key Expansion Console to provide an additional 60 programmable feature keys (for a total of 150, since the 48-Key Feature Phone has 30). Programmable feature keys The programmable feature keys can be programmed as follows: ◦ CO line key Provides direct access to a particular desired line. ◦ Station key Provides direct access to, and lamp information for, extensions, departments, guest mailboxes, etc. ◦ Speed-dial key Provides one-touch key for outside calls. ◦ Special feature keys ◦ Caller ID key (shows last 25 callers)4 ◦ Quick Switch key (for use with ESI Cordless Handset II) ◦ Overhead paging key ◦ Message monitor key ◦ Manual day/night mode key ◦ Background announce key ◦ Service observing key ◦ Personal greeting 1 ◦ Personal greeting 2 ◦ Personal greeting 3 ◦ ACD agent log on/off key ◦ ACD agent wrap key ◦ ACD administrator key ◦ Headset key ◦ Virtual Mailbox Key ◦ Virtual Answer Key ◦ Call forward key ◦ QuickPage Analog extension ports Up to 384 analog extensions can be programmed, based on the number of cards installed in the system. The ports can be defined as: • Phone Designed to provide for standard 2500-type phones. •Common ringer Connected via a tip-and-ring pair; will apply ring voltage whenever a line rings in night mode. • Fax If the auto attendant detects a fax tone, it will automatically forward the tone to the analog port programmed as a fax device. • Modem Incoming calls for a modem can be manually transferred to the modem extension; also, the modem can automatically generate outbound calls. • Doorphone A telephone connected to this port will automatically dial the programmed ring-down extension number whenever the set is taken off-hook.